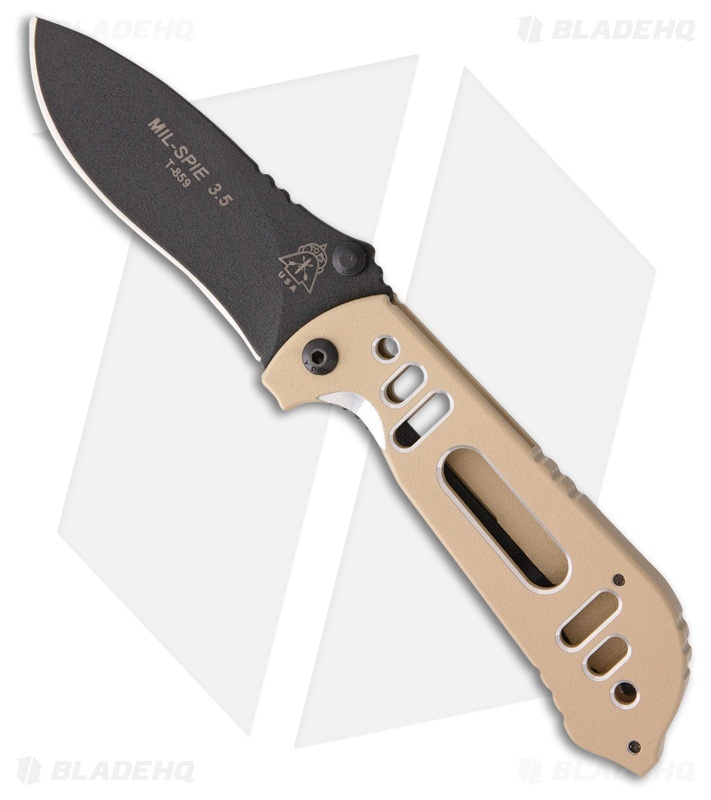 The TOPS Mil-Spie 3.5 folding knife with black recurved blade and coyote tan aluminum handles is a rugged all purpose tool ready for any forward operator. Sporting a N690Co stainless steel blade, the Mil-Spie 3.5 has a wide blade profile with a recurved cutting edge. Coated with a durable black traction coating and easily opened with the ambidextrous thumb studs. Aircraft grade aluminum handles and precisely machined to reduce weight then coated with a coyote tan traction coating. Comes in a suede shearling lined pouch with emergency whistle. N690Co stainless steel blade for fantastic edge retention and ease of sharpening. Durable aircraft grade aluminum handles. Right hand, tip-up carry pocket clip.